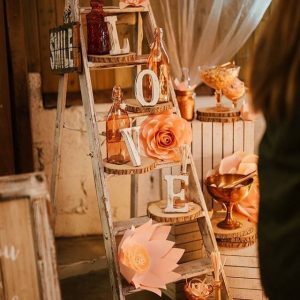 From event styling and sourcing to designing and theming… Rustic tables & benches, giant letter lights, props, room styling, table dressing…. you name it and we can help. Our relationship begins with your inquiry, so email, give us a call or drop us a message. We’ll have a consultation to discuss your requirements then work with you to collate your ideas, through mood boards, Pinterest or floor plans. At this stage we can provide you with an initial estimate, whilst working to your budget of course. Once you’re happy with your designs we take a deposit to confirm your booking and we begin! When the time comes our team will be onsite throughout set up and if required during your event. So why not get in touch? We would love to hear from you. There are lots of letter lights out there available to hire. However we have found that they really vary in quality & price. We pride ourselves on our individuality & our lights are in a premium font, which stand out from the rest. At Beau Bright our 4ft LOVE, 3ft letters & 3ft number’s are all fully dim-able for a warm glow. Hand crafted with love and finished to the highest quality. Here at Beau Bright headquarters on Grange Farm in Sudborough. We truly believe you will love them as much as we do. Congratulations! The first thing to think about when planning your wedding day is the type of day you want. 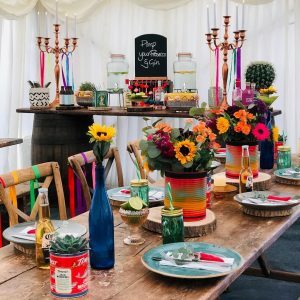 Whether your style is pretty vintage, a relaxed festival-style celebration, or a gothic fairy tale, we are full of ideas and inspiration. 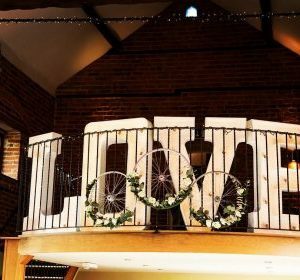 We can provide bespoke wedding design, create elegant decoration and handcrafted finishing touches. Fulfilling your vision for your unique day whilst reflecting your style and personalities. 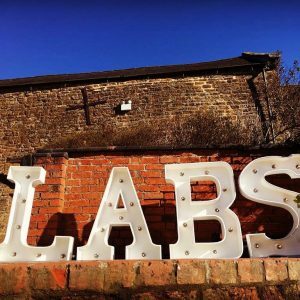 We design, create & install decorations for festivals, exhibitions and parties. We are hoarders and have a barn full of treasures. 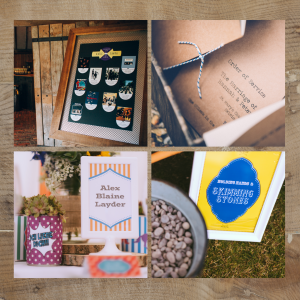 Post boxes, chalkboards, coloured glass, wood slices, cake stands and much more. For more info on ordering props or to hire any of our items please get in touch. Parties, Styling, designing, planning and running your party, ensuring that organising your event is fun and stress-free. Let us help get your creative juices flowing and for ideas for entertainment, venues, theming, crafts, catering, and imaginatively filled party bags. You can be involved as little or as much as you want and we will work with you to help create a party you will remember. We make & source for any themed party décor. Whether you need to decorate your party from top to bottom or are looking for that one hard to find item. Our 8ft x 3ft chunky tables are made from reclaimed scaffold boards. Each one seats 8/10 guests and are lovingly treated with “rugger brown” wax. 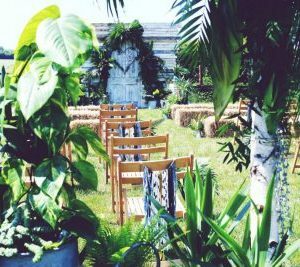 With our benches to compliment, they are perfect for a rustic wedding or party. Delivery estimated. Our Rustic Barrel Bar comes complete with two restored whisky barrels & rustic waxed 8ft/2ft scaffold board top. We can include all the accessories you will need to create a fantastic welcome drinks station or Prosecco & Gin Bar. Do your research. 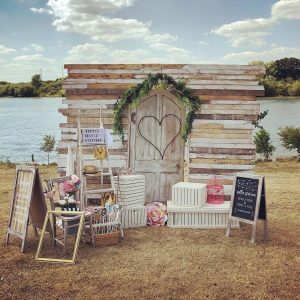 It’s tempting to jump in with both feet and buy everything you see straight away, but try not to, where possible hire don’t buy we have a fantastic range of props on offer so why not take a look……. You’ll find your budget goes much further in the long run. Balloons have come a long way and can be employed for stunning results. 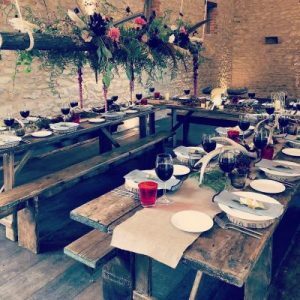 We offer a bespoke design service for private events such as weddings, parties and corporate events. Together we can explore colours, styles and themes to develop something totally individual to you. With visual merchandising and styling experience and by keeping our finger on the pulse of current trends. We can provide your window with the wow factor to capture the attention and imagination of your potential clients. Whether for a seasonal event, new product launch or special occasion. Working with you to take on board your suggestions and unique selling point, producing plans, drawings, lighting and colour concepts through to prop sourcing, making and dressing. We will design and create the perfect display to showcase your products and market your brand to its full potential.